Today I listened to a debate between William Lane Craig and Keith Parsons on “Why I am / am not a Christian”. The debate began well with Craig opening up with arguments for God’s existence while at the same time giving his testimony about how the Lord saved him. Also Craig offered arguments for the resurrection of Christ during the testimonial part of his argument. I have to hand it to Keith Parsons because compared to all the others that I have listened to the past week, Keith came out of the corner swinging. I mean he was driving home argument after argument of why he wasn’t a Christian and why the resurrection wasn’t true. He used arguments such as mass hallucinations, the wrong tomb, etc….. The problems with Keith’s arguments were that they were not original, but actually were laid down by skeptics in the nineteenth century. The bad thing about it for Keith was that these same arguments were refuted, not by theist, but by skeptics of the nineteenth century. So again Craig offered a more plausible defense for the belief of God, the Resurrection, and the Christian Faith. You can download this debate here. This debate took place in 1998. Does Atheist Believe in Fairy Tales? Atheist will claim that Christians are irrational for believing in Christ and his resurrection. They will say that they have no time for fairy tales and made up gods. They will claim that to believe in Christ and his resurrection is akin to believing in Santa Claus and the Easter Bunny. Yet, if Christians did believe and have faith in a made up deity and Atheist spent all their efforts and free time arguing or trying to refute such a belief, then would not they be irrational? I mean think about it. No one writes blogs in order to try and refute the belief in Santa Claus and the Easter Bunny. Yet Atheist are constant writers and full time bloggers of sites that are centered around an effort to try and disprove God, the Bible, and Christ Resurrection. This is irrational if such things are made up. But the fact that they spend so much time and effort trying to refute Christian beliefs, just proves that Christians beliefs are true. I ran across this picture the other day on a blog that does just what I have mentioned above. Namely it tries to state that this person has no time for make believe, yet they spend their free time trying to refute it. Here is their blog picture and a link to their blog. 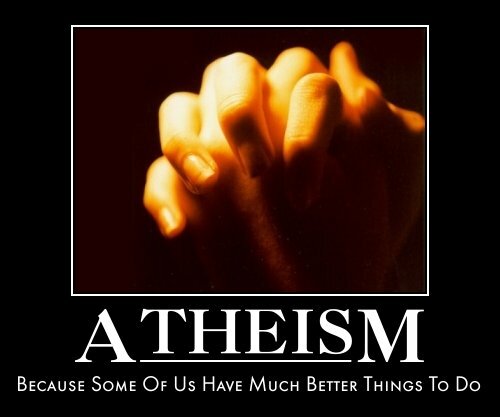 Do Atheist have Common Sense? All I really wanted to point out was the inconsistent statement of the one who wrote this post. He first states that Craig’s arguments are not sound and he wins because he is a skilled debater, but then states that Craig is an expert on the two subjects he debates. Well it seems to me if one is an expert on the subject they are speaking on, then certainly their arguments would have to be sound or they wouldn’t be an expert on the subject of which they are debating. Anyway to the credit of the one who wrote the post, he does go on to state that there is no one in the atheistic world that is able to debate Craig and win. This writer even names, names of those who are not capable. Andrew at Evaluating Christianity has put up some excellent posts of advice on how to debate William Lane Craig (one, two, three, four, five). The reason Craig wins all his debates with atheists is not because his arguments are sound, but because he is a masterful debater. Craig has been honing his debate skills literally since high school. Not only that, but he is a Ph.D. philosopher and encyclopedic historian: an expert on the two subjects he debates, the existence of God and the resurrection of Jesus. Instead of complaining at his lot, a contented man is thankful that his condition and circumstances are no worse than they are. Instead of greedily desiring something more than the supply of his present need, he rejoices that God still cares for him. Such an one is “content” with such as he has (Heb. 13:5). Today I listened to a debate between William Lane Craig and Antony Flew on the existence of God. In this debate Craig opens with 5 arguments for the existence of God. When Flew steps up to present his argument against the theistic arguments, he instead fumbles around and rambles on as if he doesn’t know where to go with his response. He constantly laments that he doesn’t have time to refute those arguments, given by Craig, while at the same time he points his attacks against doctrines of the scriptures which he doesn’t like. Craig recognized that Flew tried to argue three main points. The first point Flew argued or tried to bring up against God was that if God was omnipotent, then he would control all things within his universe. In other words, God would be able to create a world in which everyone will do exactly what God wants them to do. Craig here drops the ball and argues that God created a world that contained creatures that have libertarian freewill (1). Craig told Flew that he was a Molinist or one who believes in Molinism. Molinism was a view developed by Luis Molina over and against the Thomist’s view of grace and compatibilistic freewill (2). In other words Craig believes that man is free to either accept God or not to accept God and that God does not bend the will in order to bring about his desired purposes. Craig even takes 2 Peter 3:9 out of context in order to try and prove his point. In Flew’s rebuttal against this, Flew quoted from Augustine, Calvin, Martin Luther and the scriptures to prove that the Bible teaches that man does not have freewill. If Craig confesses to be Christian and to follow the God of the Bible, then he must admit that if God exist, then man cannot be free. Of course, Craig drops the ball on this whole point here and maintains his position that man is free and God does not control the actions of freewill creatures. (What is ironic is that the atheist is quoting scripture and interpreting it rightly against the theist). The second argument of Flew is that the doctrine of God’s love and justice are not compatible with the doctrine of Hell because the punishment is not proportionate to the crime committed. Craig showed that if Flew’s arguments were true then all he did was disprove the doctrine of Hell, but did not disprove that God exist. Craig also stated that if the punishment of Hell was for finite sins committed in this life, then he would be right, men should not have to suffer eternally. But Craig dismantles this argument by showing that sinful men will infinitely sin by continuing to reject God while in Hell for eternity and that sinning against and rejecting one’s Creator is a crime that deserves infinite punishment. Finally in Flew’s third argument he was against bodiless persons. Flew never really developed an argument against bodiless persons, but instead asserted that bodiless persons could not exist. Craig showed that Flew’s argument here was not valid. In conclusion, Antony Flew basically stuttered and mumbled and didn’t really know which way to go in order to refute Craig’s arguments for God’s existence. Antony Flew was a renown atheist most of his life, but in the last years leading up to his death he recanted his atheism. You can find that here. 1. This is called Libertarian free will, that a person is equally able to make choices between options independent of pressures or constraints from external or internal causes. 2. Compatibilist free will holds that a person can choose only that which is consistent with his nature. Therefore, for example, a person who is a slave to sin (Rom. 6:14-20) and cannot understand spiritual things (1 Cor. 2:14) would not be able to choose God of his own free will because his free will doesn’t have the capacity to contradict his nature. It is now many years since divers of us (with other sober Christians then living and walking in the way of the Lord that we professe) did conceive our selves to be under a necessity of Publishing a Confession of our Faith, for the information, and satisfaction of those, that did not throughly understand what our principles were, or had entertained prejudices against our Profession, by reason of the strange representation of them, by some men of note, who had taken very wrong measures, and accordingly led others into misapprehensions, of us, and them: and this was first put forth about the year,1643. inthe name of seven Congregations then gathered in London; since which time, diverse impressions thereof have been dispersed abroad, and our end proposed, in good measure answered, inasmuch as many (and some of those men eminent, both for piety and learning) were thereby satisfied, that we were no way guilty of those Heterodoxies and fundamental errors, which had too frequently been charged upon us without ground, or occasion given on our part. And forasmuch, as that Confession is not now commonly to be had; and also that many others have since embraced the same truth which is owned therein; it was judged necessary by us to joyn together in giving a testimony to the world; of our firm adhering to those wholesome Principles, by the publication of this which is now in your hand. There is one thing more which we sincerely professe, and earnestly desire credence in, viz. That contention is most remote from our design in all that we have done in this matter: and we hope the liberty of an ingenuous unfolding our principles, and opening our hearts unto our Brethren, with the Scripture grounds on which our faith and practise leanes, will by none of them be either denyed to us, or taken ill from us. Our whole design is accomplished, if we may obtain that Justice, as to be measured in our principles, and practise, and the judgement of both by others, according to what we have now published; which the Lord (whose eyes are as a flame of fire) knoweth to be the doctrine, which with our hearts we must firmly believe, and sincerely indeavour to conform our lives to. And oh that other contentions being laid asleep, the only care and contention of all upon whom the name of our blessed Redeemer is called, might for the future be, to walk humbly with their God, and in the exercise of all Love and Meekness towards each other, to perfect holyness in the fear of the Lord, each one endeavouring to have his conversation such as becometh the Gospel; and also suitable to his place and capacity vigorously to promote in others the practice of true Religion and undefiled in the sight of God and our Father. And that in this backsliding day, we might not spend our breath in fruitless complaints of the evils of others; but may every one begin at home, to reform in the first place our own hearts, and wayes; and then to quicken all that we may have influence upon, to the same work; that if the will of God were so, none might deceive themselves, by resting in, and trusting to, a form of Godliness, without the power of it, and inward experience of the efficacy of those truths that are professed by them.